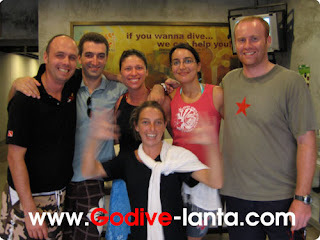 Congratulations for New Diver Mara and Dersim. 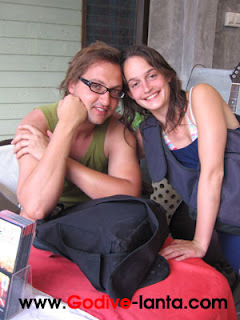 Happy diving style Go Dive..
We are so pleased to say welcome back to Morgane and Guillaume. They are French, but working in Singapore. They finished both Open Water Course and Advance Open Water Course on 16 - 21 January 2008 by Instructor Natt (French Instructor). Opening season Andaman Sea this time, 24 - 28 October 2008, they come back for fun dive 3 days diving package with two friends from French and Instructor Natt who take care of them. They found dolphins on the way back from Hin Daeng - Hin Muang trip, turtles, leopard sharks, etc. 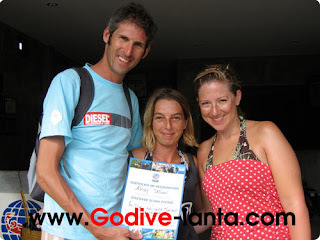 New Open Water Diver couple from Belgium. Congratulations with them for their achievement. 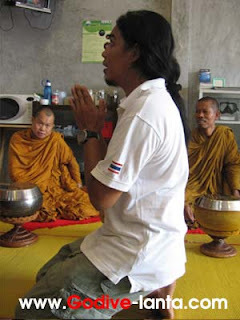 They took this lesson from 21 - 24 October 2008 with instructor Oh. Before high season is coming next November. 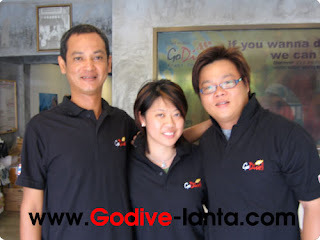 Go Dive Lanta held in the Grand Opening on 24 October 2008. 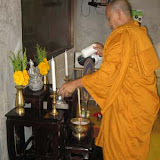 We set two parts of ceremony in the same day, Buddhist ceremony in the morning and Muslim ceremony in the afternoon. We are very happy because everybody come and bless to us. In the evening we have a little warmest dinner together. Have a good season! 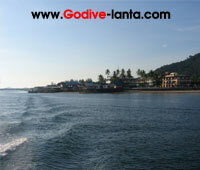 First Discover Scuba Diving Course on Koh Lanta for this season. First Open Water Course with Go Dive Lanta this season. Anthony and Adriane from Malaysia. So easy to come to Koh Lanta from Kuala Lumpur because Air Asia flight to Krabi directly and just approximately 1.15 hours arrive at Krabi and easy to get mini van pick up from Krabi Airport if you like to come to Koh Lanta please let us know we will arrange for you. 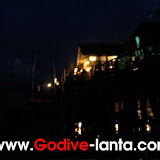 Let go to see how fun on Beer Birthday Party at Go Dive Lanta shop. We are so glad to welcome a couple, Milly from UK. and Matt from Australia. 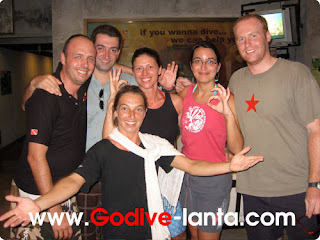 They take PADI EFR (Emergency First Response) with Go Dive in October 2008, and then PADI Rescue Diver Course also. 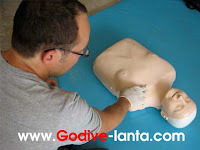 If you are interested in any PADI courses, please contact us. We will serve you with the best value.